French wholesale electricity prices have risen significantly during the last few months, largely due to an increase in carbon prices. Corporate renewable PPAs have the potential to mitigate the volatility of fossil fuels prices and de-risk energy investments for corporate consumers going forward. In France, RES is behind the development and construction of over 760 MW of wind and solar energy and employs over 200 people nationwide. RES has also been working closely with the Renewables Infrastructure Group ("TRIG"), acting as the asset manager for a large number of TRIG’s wind farm interests in France. Just last month, in light of the end of France’s feed-in tariff and mounting electricity prices, RES successfully secured two fixed-price PPAs for a total of 18.2 MW with the energy utility UNIPER. RES was the driving force of the entire operation, from the initial value identification for TRIG through the launch of a competitive tender, to the contract negotiation and signing of the two PPAs. The PPAs come with fixed prices (including guarantee of origin and capacity certificates) for the next 3 years, securing value uplift. 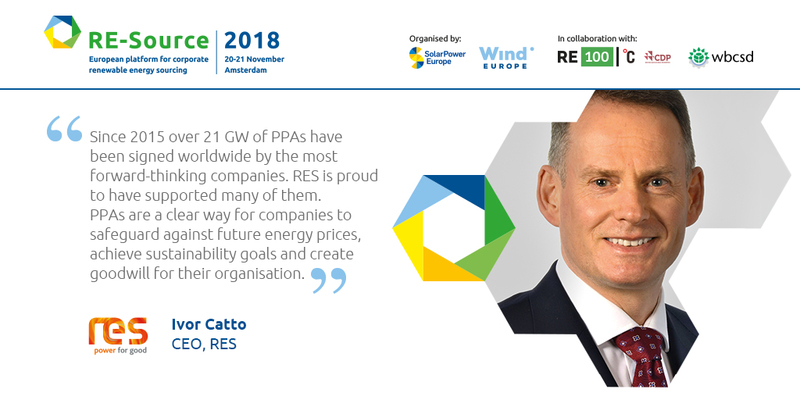 RES is the world’s largest independent renewable energy company, active in onshore and offshore wind, solar, energy storage and transmission and distribution. At the forefront of the industry for the last 35 years, RES has delivered more than 16 GW of renewable energy projects across the globe and supports an operational asset portfolio exceeding 3.5 GW worldwide for a large client base. Ivor Catto, RES CEO, and Shalini Ramanathan, RES VP Origination for Renewable Energy Systems (RES) in the Americas, will both be speaking at RE-Source 2018 next week.